Safely access a roof with a secure roof ladder. At Toolstation we stock a range of roof extension ladders in a variety of sizes and rungs to help you reach awkward heights. 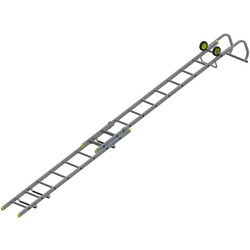 Browse the range of Lyte roof ladders which are manufactured in the UK. Each Lyte ladder is created from high grade aluminium, so you can rest assured your roof access ladder will have the strength and stability to safely support you. Our aluminium ladders are lightweight, for easy mobility. Lyte roof ladders are available to buy in a variety of different extendable lengths, from 11+9 rungs (2.94m closed length) to 17+15 rungs (4.30m closed length). To prevent any damage to a property's roof, Lyte roof ladders include rubber covered bearer bars to equally distribute weight (up to the maximum load of 150kg). 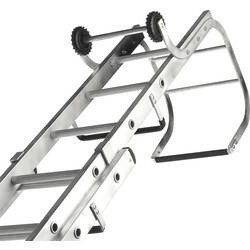 Designed for safety, our roof ladders include safety catches to prevent slipping or accidents.